Description: This listing is for the exact pistol in the photos. Here is one of the first 92 series Berettas with slide mounted safety. It comes to us from its career with the Carbinieri, the Military Police, in Beretta’s Home State of Brescia, Italy. From its label on its magazine, it was issued to Capitano Lorenzo Pecorella, who now serves as Il Comandante for the Carabinieri city of Tagliacozzo. Manufacturer was Fabbrica d'Armi Pietro Beretta, S.p.A. of Gardone. From its U prefix, 11900 range, Z suffix serial number, it was manufactured in late 1978, so the Captain was not the first officer to carry it, but the last. Type is traditional double and single action, hammer fired, locked breech semi automatic pistol. Construction is steel barrel, slide, and working parts fitted into a 7075 lightweight alloy frame. Barrel is 5 inch Government size, .580 outside diameter. Bore is six groove right hand rifling with 1:9.84 twist rate, no chrome. See pic for specs and dimensions. Chambering is 9mm Luger, 9mm Parabellum, 9x19, 9mm NATO, call it what you will, THE 9mm. The 92S was Not designed for +P ammunition, but it will feed anything else from cast bullet reloads, to steel case Russian, all the way up to Federal Premium hollowpoints. The 92 Beretta is the King of the Garbage mouths. Magazine is original issue factory Beretta 15 rounder, 15 + 1 Fully loaded capacity. Magazine usually has some brown toning on its floorplate, but more important, bears Il Comandante's name hand written on its label. With its European style magazine release, this 92S will still accept most factory magazines because they still have the right side release cut. The two best aftermarket magazines, Mec-Gar and Act-Mag, must have a slot installed like the ones we’ve had made. Safety is slide mounted, serrated tab, right hand shooter, and serves as a decocker. Finish is semi gloss blued steel slide, black anodized chrome bore barrel, and gloss black anodized alloy frame. Left side slide is importer stamped. Surface detractions are moderate, principally edge wear. We rate it as Very Good, 75 to 80 percent vicinity by our estimate. Photos, at any rate, ought to suffice for our distinguished shoppers to judge finish grade for themselves. Bore, chamber, and mechanism are all bright and clean. 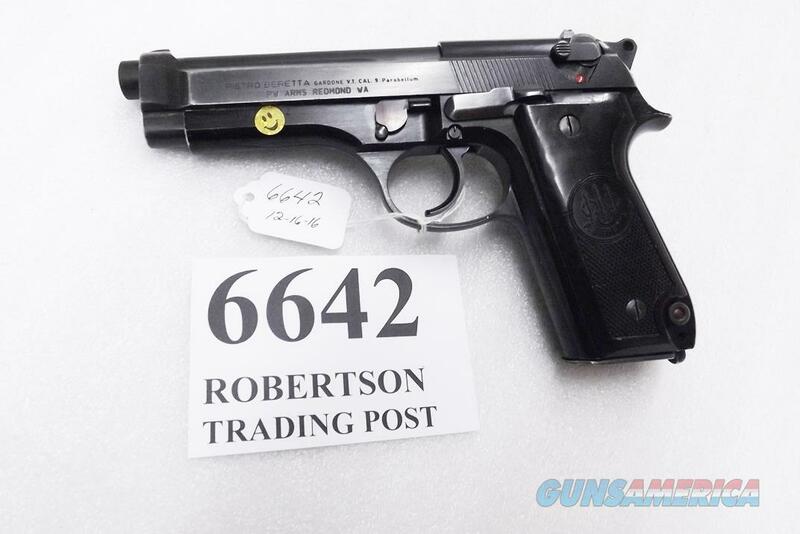 From the moderate amount of slide contact whitening to the barrel surface, we estimate this Beretta has been fired fewer than 2000 times, no rounds at all for a 92. Replacement pricing on a new JS92F300M Beretta, this one’s descendant, is $699 on berettausa com. We’re offering the Officer marked Beretta in the photos, however, for only	$ 339.00. Not transferable to civilian residents of California or Massachusetts. Search term c1978 will bring up all our 92S Berettas on this venue. For any civilian buyers in Connecticut, District of Colombia, Hawaii, Maryland, or New York, deduct $8 with no magazine, or add $20 for a modified new Mec-Gar 10 rounder. Add any number of new HFC 15 round magazines, fit 92S Beretta and all Taurus PT92s and PT99s, only $16 each [no go on new model Berettas, 92FS M9 etc.]. Add a set of new Herrett’s Walnut Palmswell grips, only $26 and no extra shipping charges. NEVER buy a gun for someone else, that’s like a felony straw purchase. $15 ship lower 48; $40 AK, Guam, HI, PR, USPS Priority fully insured. NO AMEX NO PAYPAL, BUT GA Pay GB Pay, MC/Visa/Discover/USPS MO paid orders shipped ASAP. 7 day hold on checks. FFL ok by fax, e-mail or mail, please ask your dealer to put your name and Gun Brand on there. 7 day money back on used, BUT no return / refund on New, layaway, or ammo. We do not pay transfer fees or return shipping. Lay-away 20% down, balance in 90 days. Phone hours 8:00 – 5:00 CST Mon - Fri CST. Local pickup OK. Robertson Trading Post 117 Front Street PO Box 365 Henderson, Tennessee 38340 We Buy, Sell, or Trade. We always have, since 1952.